The DAC is being built in stages and is merging OPD's existing license-plate readers and gunshot detectors with surveillance cameras. 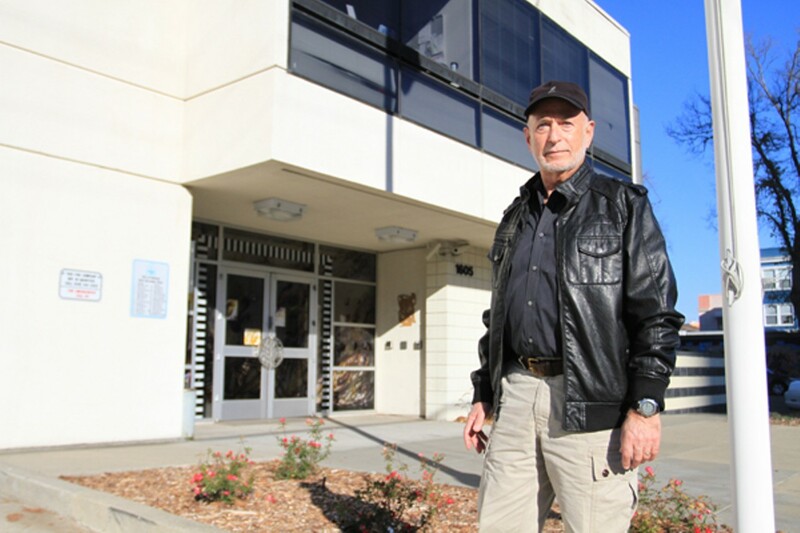 Darwin BondGraham and Ali Winston won first place in the continuing coverage category for their series of investigative reports on Oakland’s surveillance center, also known as the Domain Awareness Center, in the 37th Annual Greater Bay Area Journalism Awards in the non-daily print division. Oakland's citywide surveillance system, the Domain Awareness Center, or DAC, gained national notoriety earlier this year when some city residents voiced strong concerns about the project's privacy and civil rights implications. City officials and supporters of the DAC have responded by contending that objections over privacy and civil rights issues are overblown and that the true purpose of the surveillance center is to help Oakland finally deal with its violent crime problem. But thousands of pages of emails, meeting minutes, and other public documents show that, behind closed doors, city staffers have not been focusing on how the DAC can lower Oakland's violent crime rate. So what is the real purpose of the massive $10.9 million surveillance system? The records we examined show that the DAC is an open-ended project that would create a surveillance system that could watch the entire city and is designed to easily incorporate new high-tech features in the future. And one of the uses that has piqued the interest of city staffers is the deployment of the DAC to track political protesters and monitor large demonstrations. "Information is always fundamentally about control," she added. Once it's fully operational, the DAC will give Oakland officials an unprecedented ability to monitor peoples' movements, associations, and activities. The Domain Awareness Center is being built in stages and will merge OPD's existing license-plate scanners and gunshot detectors with video feeds from hundreds of surveillance cameras — many already in place and some to be installed in the future by several different agencies throughout the city — into a central hub. Oakland police will monitor this "flood of data," as one DAC project presentation called it. Originally limited to monitoring the Port of Oakland, the DAC has since expanded to encompass the entire city. The Oakland Privacy Working Group, an activist coalition opposed to the DAC, obtained thousands of pages of emails and other public records related to the project from the city via a California Public Records Act request. The privacy group then shared the documents — which cover the period from August 2012 through September 2013 — with us. While the emails reveal a great deal about the DAC, they are also notable for what they do not talk about. Among the hundreds of messages sent and received by Oakland staffers and the city's contractor team responsible for building the DAC, there is no mention of robberies, shootings, or the 138 homicides that took place during the period of time covered by the records. City staffers do not discuss any studies pertaining to the use of surveillance cameras in combating crime, nor do they discuss how the Domain Awareness System could help OPD with its longstanding problems with solving violent crimes. In more than 3,000 pages of emails, the terms "murder," "homicide," "assault," "robbery," and "theft" are never mentioned. The records also show that the Oakland City Council's attempt to rein in the features of the DAC that pose the most serious threats to civil liberties, and to craft a privacy and data retention policy, may be too little, too late. City staffers have apparently found a way to work around the intended policies of the council. Moreover, the documents reveal that, behind the scenes, the Oakland Police Department, despite its long and troubling record of violating people's civil rights, is in charge of designing the DAC and the policies that will govern its use. Furthermore, records show that the DAC already has so-called "video analytic" capabilities. Video analytics include features like automated vehicle and pedestrian tracking, motion recognition, and a "virtual fence" that determines when people approach or attempt to breach fences surrounding Port of Oakland property. The documents also reveal that the DAC contractor, SAIC, now called Leidos Holdings, Inc., over-billed the City of Oakland by upwards of $160,000 by purchasing expensive software and gadgets that SAIC staff kept for themselves, and by filing invoices for work that wasn't done. Several Oakland staffers caught this and deducted the charges, but only after forcing SAIC to exhaustively account for labor, tools, and $94,000 in goods received for which there were no receipts provided. It's unclear just how much of Oakland will be put under continuous, pervasive surveillance by OPD with the DAC, but internal city records show that plans to incorporate cameras inside Oakland's public schools and Oakland Housing Authority properties are very much alive. So, too, are plans to feed in surveillance footage from hundreds of other cameras already in place around the city through OPD's commercial camera lending program, local transit agencies, and a planned surveillance system the Downtown Oakland Association and the Lake Merritt Uptown District Association business improvement districts intend to build. And cameras are just the beginning: Documents mention monitoring "social media," "web feeds," and "text messaging." Large surveillance centers are becoming increasingly common nationwide: They now exist in New York City; Chicago; Baltimore; Washington, DC; and Hudson County, New Jersey. Political leaders typically contend that such centers are necessary to combat terrorist threats and reduce crime. But Rajiv Shah, a professor of communication at the University of Illinois-Chicago who conducted a study on the efficacy of Chicago police's crime cameras, said surveillance systems aren't guaranteed to help police reduce crime. They do, however, serve political goals of looking tough on crime. In Chicago, the camera network was set up during the mid-2000s with no public input or oversight. And local officials justified it by pointing to the dual threats of terrorism and crime. But the latter, Shah said, is a red herring. "It's not really about solving crime," he said. "That's just something that's tacked on at the end to make it easier for the public to swallow." From a political perspective, he said, the questionable efficacy of networking cameras comes in second to the political currency of claiming credit for a brick-and-mortar project geared toward fighting violent crime. "It's like every local politician: 'I'll do something to create more jobs. I'll do something to reduce crime. I'll set up a camera system.'" In Oakland, city leaders have also pointed to the city's high crime rate as the primary reason for building a surveillance center. Supporters of the DAC have also argued that the possibility of infringing on people's privacy or civil rights pales in comparison to the need to address violence in the city. "There are so many people in West Oakland who feel terrorized by gunplay and prostitution, gangs or just straight violence," said Councilmember Lynette Gibson McElhaney, whose district encompasses downtown and West Oakland. There are a large number of residents in Oakland — poor, rich, black, white, Latino, and Asian — who desperately want something to be done about the violent crime that has taken thousands of mostly young African-American and Latino men to the grave over the past thirty years, and McElhaney said these communities support surveillance cameras. But it's unclear whether residents understand how the DAC is going to be used. Civil rights attorney Jim Chanin, an Oakland resident who has been an integral part of the team involved in federal oversight of OPD for the past decade, said he's concerned about the police department's track record of misconduct and its history of disproportionately targeting people of color. "Under the right circumstances, [the DAC] could solve some crime, and help deter bad behavior by police, since they're still not using their [chest mounted cameras] properly," Chanin said. "However, if done wrong, the surveillance center will be a titanic waste of money. It will invade people's privacy and become a bureaucratic nightmare from managing so much data. "There are fundamental problems with how OPD collects and handles evidence," he continued. "They can't even deal with the resources they have now." Professor Shah's observations about the use of networked surveillance systems for purposes other than crime-fighting is borne out by official documents and correspondence tracing the evolution of Oakland's Domain Awareness Center. Public records show that city staffers are interested in using the DAC to monitor political protests. This aspect of the DAC first became public in August when Renee Domingo, director of Oakland's Emergency Management Services Division and the head of the DAC project team, published an article in the government trade publication Public CEO justifying the need for the surveillance hub. "Oakland's long history of civil discourse and protest adds to the need [for the Domain Awareness Center]," Domingo wrote. "The Oakland Emergency Operations Center has been partially or fully activated more than 30 times in the past three years to respond to large demonstrations and protests." Other records echo this political mission. In meeting minutes from a January 2012 meeting of the San Francisco Maritime Exchange's Northern California Maritime Area Security Committee, Domingo and Mike O'Brien, director of security for the Port of Oakland, described the DAC system as a tool that would help control labor strikes and community protests that threaten to slow business at the port. Following security reports from the US Border Patrol and the FBI, Domingo told the committee that Oakland law enforcement was "hoping that things would quiet down with the Occupy movement in the new year," according to the official minutes. Domingo thanked the Maritime Exchange for its support of Oakland's port security grant projects, which includes the DAC. O'Brien went further, explaining that the port's Emergency Operations Center (which now feeds into the DAC) "made use of seventy new security cameras" to track the protesters, and added that the system will ensure that "future actions [do] not scare labor away." Dan Siegel, a longtime civil and workers' rights attorney in Oakland, said the city staffers' focus on political unrest, even at the port, is disturbing. "There's a huge difference in protecting the port from potential acts of terrorism than from spying on port workers and others who may have political or economic conflicts with port management and the companies that operate the terminals," said Siegel. "What we see taking place is a complete blurring of that line where port security now includes tracking Occupy, longshore workers, and now recently the Port Truckers Association." During construction of the first phase of the DAC, from roughly August 2012 to October 2013, city staffers repeatedly referred to political protests as a major reason for building the system. Emails to and from Lieutenant Christopher Shannon, Captain David Downing, and Lieutenant Nishant Joshi of OPD and Ahsan Baig, Oakland's technical project leader on the DAC, show that OPD staffers were in the surveillance center during the Trayvon Martin protests this year, and that they may have been monitoring marches in Oakland. In the same chain of emails, Shannon asked if the Emergency Operations Center and the DAC control room's layout had "changed much since May Day," referring to yet another large political rally in Oakland when the DAC appears to have been used by OPD to monitor demonstrations. On July 25, Baig requested that SAIC produce a demonstration video of the DAC's capabilities to show off at the next City Council meeting. "Try your best. I need the Demo ASAP, it shouldn't be more than 3 mins.," wrote Baig. "Check out http://www.occupyoakland.org website to understand the background." On July 31, dozens of Oakland residents attended a city council meeting to speak out against the DAC. The next day, Jerry Green, an employee of Radio IP, an Oakland contractor, emailed Baig a copy of a San Francisco Chronicle article entitled, "Oakland OKs Money For Surveillance Center," that described the protest. The title of Green's email was "these upset citizens must have something to hide." Baig responded simply, "Yep..."
Law enforcement surveillance (both federal and local) of demonstrators has been a constant in Oakland since the killing of Oscar Grant in 2009 sparked chaotic street demonstrations. Police infiltrated organizing meetings, sent undercover officers to mingle in crowds during several demonstrations, and recorded the protests with multiple video teams. Police took a similar approach during Occupy Oakland. Police also compiled yearbook-style photo dossiers of prominent demonstrators, regardless of whether they had committed a crime or not. Siegel took issue with the DAC's focus on First Amendment activity. "The communications among Oakland city staff and DAC contractors demonstrate their intent to create a surveillance system that goes far beyond what might be used to detect terrorist threats and help the OPD solve serious crimes," he said. "Instead, they are building a system that will be used to monitor political demonstrations and identify individuals involved in protests. The city's contractors betray their true attitudes by describing people opposed to state surveillance as 'upset citizens' with 'something to hide.'" In August 2012, when port officials were brainstorming the extent of the DAC's surveillance powers, they hired a company called GuidePost Solutions to help. GuidePost Solutions has an office in Oakland, but is headquartered in Manhattan. Its executives include former officials from NYPD, the US Attorneys' office, the New York City District Attorneys' Office, and other law enforcement agencies. 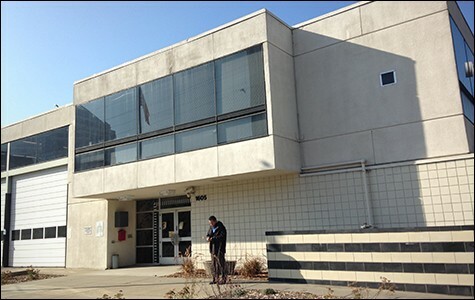 The DAC blueprint that GuidePost Solutions and the port devised to send to potential contractors as a Request for Qualifications (RFQ) drew the attention of Oakland police. Lieutenant Michael Poirier read the plan and criticized it as being "too Port specific." "While the DAC will of course serve the Port, I see the majority of information in/out will be 'live' on City streets," Poirier wrote in an email to port staffers and to Raymond Kolodzieczak of GuidePost Solutions. "This RFQ does not have the focus of 'live' operational information center." Poirier recommended revising the project description to reflect OPD's plan to make the DAC a citywide system that includes "any City camera, shotspotter, LPR [automated license-plate readers]," and he even added, "City Databases (planning, permits, business tax, city GIS etc)" as information to be fed into the DAC. Poirier ended his lengthy email stating, "If the RFQ goes out as is, I think the vendor will be 'surprised' when the true nature/function (operational mode) of the DAC is requested." In public comments to the city council in July, Lye of the ACLU questioned whether there were any privacy policies in place to govern how the DAC would collect and store data. There were not. Lye met with city staffers to discuss the numerous ways the DAC could serve to undermine civil rights. She said she opposes construction of the DAC, and that her participation in those policy meetings should not be taken as ACLU's endorsement of the project. Councilmembers Dan Kalb and Libby Schaaf subsequently spearheaded a resolution requiring the city to develop a privacy and data retention policy, and for the rules to be in place by March, before the DAC becomes fully operational. In the same email conversation chain, Oakland project leader Baig referred to the DAC as having "TB of data storage," meaning terabytes. Standard DVDs hold 4.7 gigabytes of data, enough for a couple hours of high-definition digital footage. Many hours of lower-resolution video footage could be saved in just a few gigabytes. There are 1024 gigabytes in 1 terabyte. If Baig's claim that the DAC has terabytes of video storage capacity is correct, then the DAC is already outfitted with hardware to store the equivalent of at least 435 full-length movies. And the DAC's hardware likely has many more hours of storage capacity than that. "Is that your intention?" Sotelo asked Domingo. "No, we want the flexibility to do this after Council approves the Policy," replied Domingo. Baig then cut into the email exchange, asking Domingo, "How are you going to change after the Council approval?" Domingo responded, "We've done this before recently. Amadis and I will handle it." "It looks like city staff thinks they have flexibility to alter the policy after council approves it," said Lye of ACLU. "That raises huge questions." City staffers involved in the project and the email exchanges didn't return our phone calls and emails during the month we spent reporting this story. The project's contractors also declined to speak to us. Councilmembers Kalb and Schaaf also did not respond to repeated requests for comment. Siegel reviewed the above email exchange and many other records at our request. "I think they're trying to pull the wool over the eyes of the city council and the ACLU about what data is stored and what's not," he said. He added that other records show that whether or not the city's policies end up allowing the DAC to centrally warehouse video, the footage will still be saved and accessible. "They'll have incident markers, links that allow them to pull up footage from its source," he said. "So what difference does it make if they're storing it in the DAC or not?" The city's data retention policy is currently being drafted by the Oakland Police Department under the supervision of Deputy Chief Eric Breshears and the City Attorney's Office. Oakland resident Mary Madden, a member of the Oakland Privacy Working Group, opposes the DAC unequivocally. She said OPD's role in the surveillance system's construction and in drafting privacy policies raises even more problems. "If Oakland would like to give the impression of caring about privacy, they should have the privacy guidelines crafted by an independent privacy expert, who understands the complex issues at stake, as well as the full DAC system and all its components," she said. 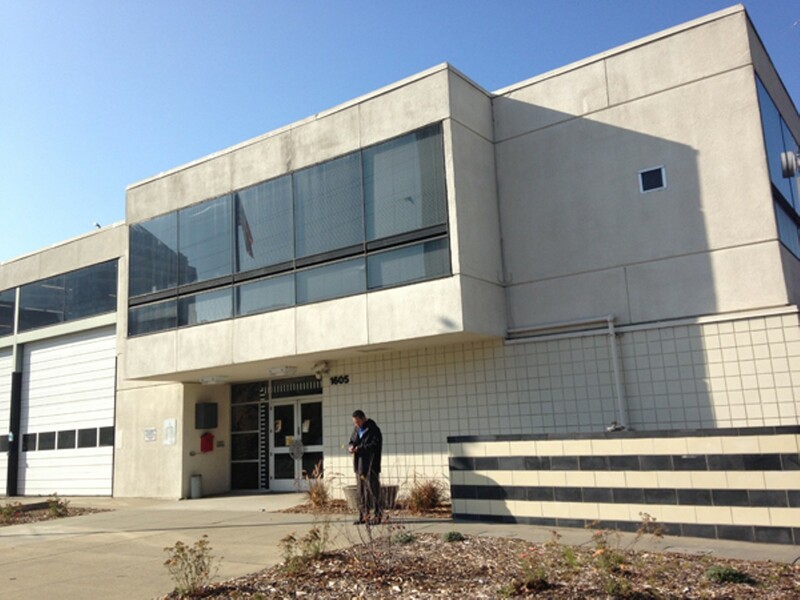 "OPD has a history of not following their own rules, as the federal monitor pointed out. Examples include the crowd control policy and use of lapel cameras, so how can we trust OPD to follow their own privacy rules for the DAC?" Once the Domain Awareness Center's Phase 2 construction is finished in July 2014, the center could link an untold number of public and private video cameras from businesses, traffic intersections, public housing properties, highways and onramps, transit stations, sports facilities, and public schools into a centralized hub. The DAC will also collect OPD's automated license-plate reader data, ShotSpotter gunshot detectors, and social media feeds — all to be monitored on a live basis. July 2013 emails between SAIC project manager Taso Zografos and Chris Millar, a contractor hired to help oversee the DAC, identify sources of data and surveillance capabilities that would be built into the DAC in several phases. According to the emails, the first phase of "prioritized integrations" included the port's vehicle tracking system and its mapping systems, weather and seismic warnings, and video from BART and the Oakland Airport. The second group of "prioritized integrations" included police and fire dispatch, automatic vehicle location systems for OPD and OFD vehicles, video from Caltrans and California Highway Patrol cameras, and unspecified informational links between the DAC and two law enforcement "fusion centers" — hubs in which law enforcement intelligence is centralized — including the Northern California Regional Information Center. Oakland officials are also considering applying for grant funding for the DAC on the basis that it also operates as a fusion center. Such a designation could open up the DAC for funding sources additional to the federal grants that have bankrolled it to date. According to the emails, "potential integrations" into the DAC include video feeds from the Oakland Coliseum, Oakland's red-light cameras, AC Transit, BART, city libraries, City Hall, Oakland Housing Authority properties, buildings owned by the Oakland Unified School District, and OPD's automated license-plate readers. 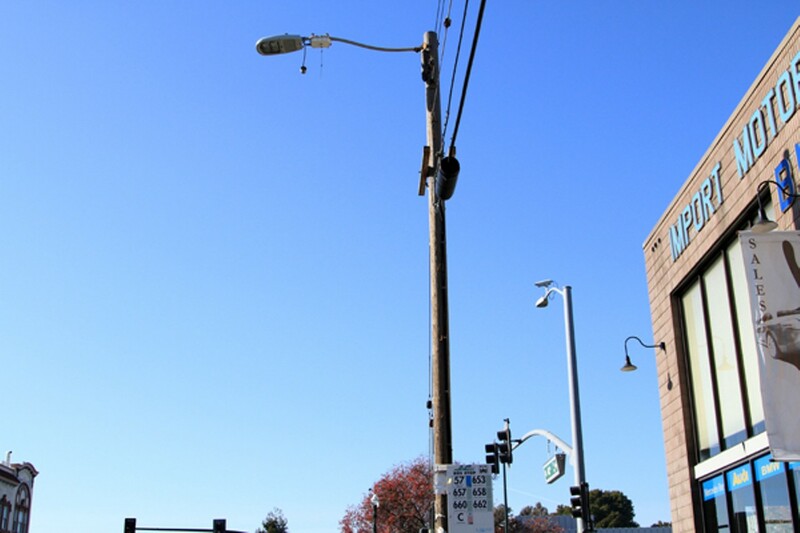 If the public housing, school, and public transit cameras are incorporated into the DAC, Oakland's communities of color could be placed under disproportionately intense surveillance. "In many instances, surveillance issues aren't just privacy issues; they're also racial justice issues," said Lye. "This means we're going to have complete surveillance of communities of color when they're going about their lives and doing nothing wrong whatsoever." A critical component of the Domain Awareness Center will be "video analytics," or software that can interpret raw information from video streams and identify certain behavior or characteristics. The port already uses motion-detection software and image recognition around port property as part of a virtual fence that alerts staffers if someone is approaching facilities that are off-limits to the public. Emails between city and port officials in May revealed that port staffers have programmed port cameras to send email alerts when the video analytics detect cars engaged in street racing on Middle Harbor Road. The new technology has not put a halt to the chaotic and occasionally violent races. The most controversial form of video analytics is facial recognition software that is programmed to automatically identify persons based on unique facial features. Source databases for facial recognition programs include employee records, DMV photos, and mugshots from law enforcement booking systems. The city council voted in July to bar the use of facial recognition during the DAC's current funding phase. However, facial recognition for closed-circuit television systems is rapidly gaining popularity among law enforcement. In January 2013, the Los Angeles Police Department began testing mobile surveillance cameras equipped with facial recognition software in the San Fernando Valley, with the intent of identifying known or wanted criminals. The Chicago Office of Emergency Services has also experimented with facial recognition programming for its 24,000 networked cameras, using Cook County's 4.5 million booking photos as the data source. In May, Chicago police officers made their first arrest with the help of facial recognition technology. Shah of the University of Illinois-Chicago noted that the combined use of facial recognition technology and license-plate readers, which would be possible if the former technology is used in conjunction with the Oakland surveillance center, have the potential to take individual tracking to an unprecedented level. "Facial recognition and LPR directly tie to someone — [it's] what causes the most concern," said Shah. 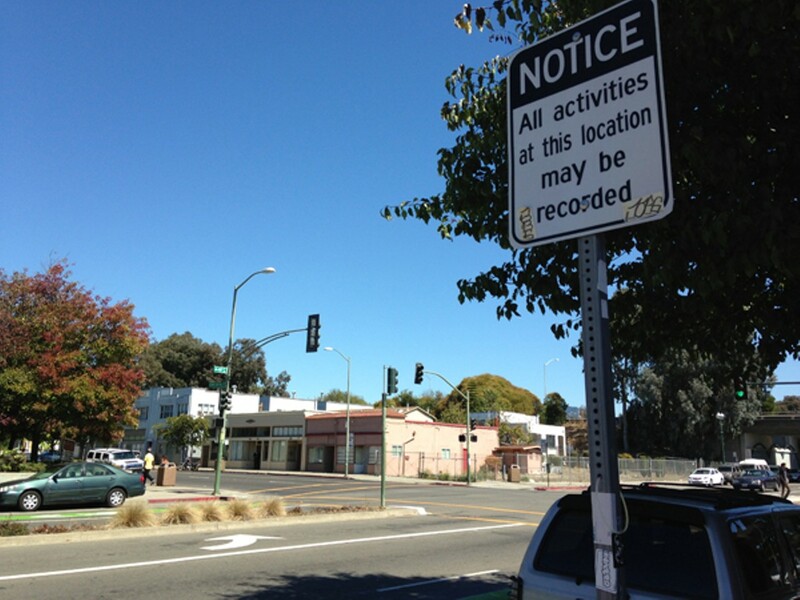 The DAC is only one of several surveillance systems in progress in Oakland. In June 2012, then-Oakland Police Chief Howard Jordan and then-Assistant Chief Anthony Toribio met with representatives of the Total Recall Corporation, a firm marketing a surveillance system called CrimeEye. Total Recall's cameras can zoom in from great distances, and can store footage for as long as a police department wants. If OPD opts to buy this camera unit and software package, a single unit at the intersection of 14th Street and Broadway could have a range east to Lake Merritt, north to the Paramount Theater, and south and west to Interstate 880, according to materials the company provided to the city that we obtained. In August, then-Oakland Chamber of Commerce Vice President Paul Junge and city staffer Joe DeVries exchanged emails about incorporating cameras owned and operated by the Downtown Oakland Association and Lake Merritt Uptown District Association business improvement districts into the Domain Awareness Center during phase three of the DAC construction in June 2014. DeVries also mentioned the possibility of including cameras installed by various neighborhood associations in the DAC. Documents we obtained also reveal the Uptown and downtown BIDs are building their own surveillance center, and have submitted a $30,000 grant application to the MetLife Foundation to fund it. At some future date these cameras are also to be linked into the DAC. In an influential 2012 paper about police surveillance technologies, Georgetown University law professor Laura Donohue observed that surveillance advances like facial recognition, vehicle tracking, and networked video monitoring are altering the nature of American society. "What we are witnessing is a sea change in how we think about individuals in public space," Donohue wrote. While Oakland's elected officials and city staff struggle with how to regulate this sprawling surveillance project, abstract issues such as privacy and security have become immediate and concrete for many city residents. But the courts, as Donohue noted, are decades behind the newly ubiquitous surveillance methods. In one recent case — US v. Jones — that bought the law partly up to speed, the DC Court of Appeals ruled that law enforcement officers violated the Constitution by placing GPS trackers on vehicles without warrants. (This ruling was later upheld by the US Supreme Court.) In the unanimous US v. Jones decision, DC Court of Appeals Justice Douglas Ginsberg wrote of the incredible power modern technology affords law enforcement: "A person who knows all of another's travels can deduce whether he is a weekly churchgoer, a heavy drinker, a regular at the gym, an unfaithful husband, an outpatient receiving medical treatment, an associate of particular individuals or political groups — and not just one fact about a person, but all such facts." The DAC, if completed as it's currently designed, will make Judge Ginsberg's scenarios a reality in Oakland. Now that the city has scaled back the size and scope of the DAC, new concerns are emerging about surveillance and the lack of governmental transparency. The city's leaders have developed a troublesome habit of proposing dubious crime-reduction plans that seek to trample on people's rights. Federal funds are financing the construction of the Domain Awareness Center, but city documents show Oakland likely will have to pay at least some of the DAC's $1.2 million in annual operating costs.